BRIGHTON, Mich.- If you or someone you know is or may soon be in the market for a new job, listen up! To get to the point 2,350 Ford Jobs are Coming to Southeast Michigan! But here's more information: As part of an agreement with the United Auto Workers union, Ford Motor Company has committed to invest $6.2 billion in United States plants by 2015. Michigan will be one of the first states to benefit from that agreement very soon! Ford has announced that they plan to invest more than $773 million on new equipment and capacity expansions in six of its manufacturing plants in Southeast Michigan. 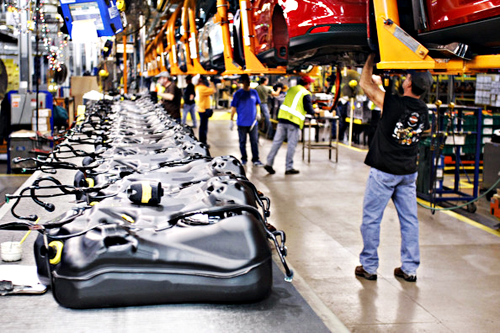 Which means that 2,350 Ford Jobs are Coming to Southeast Michigan as a result! This investment will not only create new jobs but will retain 3,240 jobs as well. And these jobs are just a small portion of the 12,000 jobs that Ford has agreed to add/retain in the United States by 2015. Brighton Ford is proud to be a Ford Dealer Serving Metro Detroit and to be able to help you with all of your auto needs. Come on in to see how we can save you money on a New Vehicle, Used Vehicle, or Vehicle Service with our Coupons. Stop by our lot located at 8240 Grand River Ave. just north of I-96 in Brighton. We are a family owned and operated business that strives on customer satisfaction. For more information on Brighton Ford visit BrightonFord.com or give us a call at (800)-836-8206.